During recent workshops in Norwich we explored the general appeal of different types of low carbon innovations using repertory grid technique (RGT). This method has been widely used in consumer research to segment markets according to how products are valued by consumers. 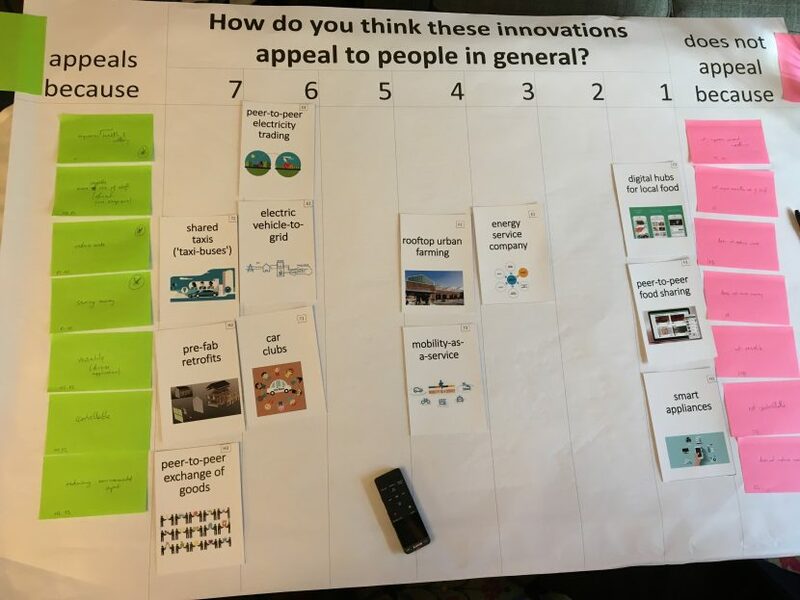 Using cue cards and a grid, we talked to over 40 people about the general appeal of 12 different low carbon innovations, concluding with a rating exercise in which they scored the innovations on the three attributes they considered to be most important. The method produces rich narrative and quantitative scorings which we are using to cluster innovations according to how they appeal to mainstream consumers. Watch this space for early results! David, M., Dale, L. (2000) Exploring consumer product construct systems with the repertory grid technique. Qualitative Market Research: An International Journal 3, 127-144.